If you hear a soft chittering overhead as you walk down a city street in summer, look up. You might see darting, fast-moving, cigar-shaped little birds with pointy wings that curve behind them--chimney swifts. They are seen and heard overhead in cities from the Atlantic coast to the Rocky Mountains, and from southern Canada to Mexico. The birds return to North America after wintering in South America. Most of us will only ever see them while they are flying in pursuit of insects. They spend all of their daylight hours on the wing, resting briefly if at all. They scoop up drinks of water in flight and bathe by skimming the surface of water and shaking it off as they rise. They even gather material for nests while flying; Stokes (1979) described swifts diving into trees to grab twigs and break them off, and transfering the twigs from foot to beak in flight. Chimney swifts don't perch in trees or land on the ground, so they seem never to land. It seems strange to us today, but swifts were once thought to lack feet altogether. The scientific name for the avian family in which they are classified is Apodidae, which literally means "without feet." But chimney swifts do land, just not in places easily accessible to humans. At night they roost in chimneys, smokestacks, airshafts, steeples, stone wells, and other similar dark places. Their tiny feet have long claws, which allow them to cling to walls. Their short, stiff tails help them perch vertically. The birds are about five inches long, gray to black, with silvery gray throats. There are no external differences between males and females. When they are resting, the tips of their long and narrow curved wings cross by an inch or more. Their mouths are wide for scooping insects from the air. Swifts arrive in North America in March and are on their way back to South America by early November. Typically a single pair nests at a site, but non-nesting individuals may roost there simultaneously. (This once gave rise to a mistaken belief that they breed in large colonies.) They build light, strong nests of small twigs, which they attach to an interior wall of a chimney with their glue-like saliva. The nest protrudes about two or three inches, like half of a saucer stuck to the wall. Three to seven tiny white eggs are laid. Males and females share incubation, which lasts for about three weeks. During cold spells, both parents may sit on the eggs together. Chimney swifts form long-term bonds and pairs that have been banded are frequently recovered together. A 40-year-long study of swifts nesting in airshafts of buildings in Kent, Ohio showed that when both members of a pair that had previously nested together returned to a site, almost all of them reunited to nest again. Swifts eat nearly a third of their weight every day in mosquitoes, flying ants, midges and other small fliers, making them welcome summer guests in most neighborhoods. Both parents feed regurgitated food to very young nestlings. After the nestlings are about a week old, the parents collect insects in a throat pouch and produce an insect ball (sometimes called a pellet) to feed the nestlings. Bird rehabilitators Kyle and Kyle (2004) found that young birds receive digestive tract flora during parental feedings. Rehabilitators faced with the care of very young chimney swift orphans may use a method described by Kyle and Kyle in which the orphans are fed tong-held mealworms that have been swabbed in the throat of an older rehab bird. Immune competence is transferred with the saliva. After a few days of such feedings the orphans are equipped to resist infections. When John James Audubon wrote about these birds in the early 1800s, they were known as American swifts. At that time, they nested in hollow trees and other natural shafts. They were not found west of the Mississippi River. Audubon wrote about his nighttime visit to a roost in Birds of America. He carried a darkened lantern into the interior of a hollow sycamore tree 70 feet tall and seven or eight feet in diameter. When he uncovered the lamp, he saw the interior surfaces of that huge tree completely covered with small dark birds, perched side by side. The birds were silent. As America expanded westward, consuming forests, natural roosts like this declined but chimneys multiplied. As swifts lost their natural homes they readily adapted to using man-made structures. An ornithologist reported trapping 6,985 birds in a single day--September 21, 1952--at a roost in the sixty-three foot chimney of a junior high school in Rome, Georgia. Chimney swifts may have to change their habits again. Over time, our typical chimneys have evolved from wide open-topped brick stacks to narrow, metal-lined shafts with caps over them. Metal chimneys are unsuitable for swift roosts or nests because the birds cannot hold on to the slippery surfaces. The nests will not stick to the metal. Swifts need surfaces that they can grasp, like stone, firebrick, or masonry flue tiles with mortared joints. Although metal chimneys should be capped because animals can become trapped in them, homeowners routinely cover all chimney openings with caps or screens, so even if they are appropriate for swifts, they are not available. Most people would probably not mind if swifts used their chimneys during summer, especially considering the benefits of having voracious insect-eaters nearby. Attracting chimney swifts requires only keeping the top of the chimney open and the damper closed from March through October. It is also helpful to schedule chimney cleaning for early March, after the fire season but before the birds return. One common concern about swifts is that sometimes the begging noise of nestlings can be heard from inside the house. The problem can be ameliorated by making sure the damper is closed and possibly by placing some insulation or foam rubber below it. Anyway, the period when they are loud enough to be heard is usually only for the two weeks just before they leave the nest. Conservationists are concerned about the future of chimney swifts. There is a movement to promote awareness of the problem of vanishing nest sites. Contributions can be as simple as promoting the preservation of smoke stacks and other swift sites, even when the old buildings they are attached to are demolished. Some people provide simple chimney-like towers where swifts can roost and build nests. The North American Chimney Swift Nest Research Project of The Driftwood Wildlife Association can be accessed at http://www.chimneyswifts.org. Their newsletter, Chaetura, provides instructions for building towers and for helping to conserve chimney swifts. A city dweller hoping to observe interesting bird behavior has good opportunities with the chimney swifts. The birds do a lot in the open air. It is possible to see what Scopes (1979) described as "together flight" in which four to seven birds fly close without the typical darting movements of aerial foraging. Or a pair may fly in tandem, the rear bird, which flies slightly higher but very close, suddenly lifting its wings above its back in a stiff V. The leading bird may also fold its wings as the pair glides for about ten seconds then returns to flapping flight. During migration, large numbers of swifts congregate around roosts before sunset, flying in large noisy circles. 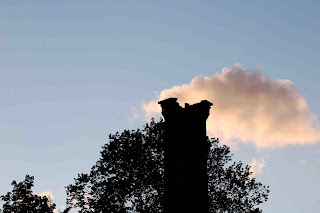 One population returns to a chimney in Northville, NY, every year on the sixth of May; the town gathers to watch the birds swarm in the late evening and then suddenly fly down the chimney. The town's website can help you plan a visit: http://www.northvilleny.com. Go at dawn to see a torrent of swifts explode out and up into the morning sky, and disperse, as John James Audubon wrote "with the quickness of thought."